The project is divided into five workpackages. WP1 aims at the coordination, communication and dissemination of the project. WP2 ensures the activities with veterinary laboratories of virology. WP3 coordinates the human virology labs and the biosafety activities. WP4 is responsible of the medical entomology groups and related activities. 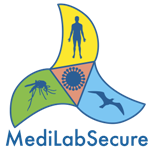 WP5 is responsible of the public health activities related to the improvement of the integrated surveillance that will enhance the preparedness of beneficiary countries to emerging and re-emerging mosquito transmitted viruses and emerging respiratory viruses. A first cluster of activities, concerning vector-borne pathogens aims at coordinated actions between WP2,3,4 and 5. 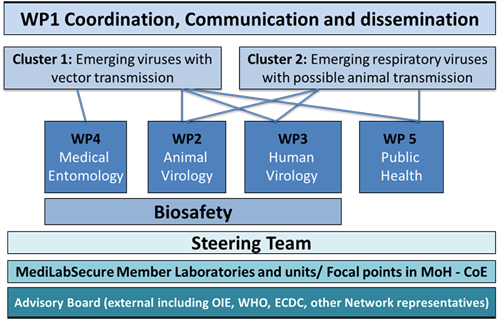 A second cluster of activities focusing on emerging respiratory viruses with potential animal transmission aims at coordinated actions between WP2,3, and 5. Priority has been given for training activities to those laboratories with both respiratory and arboviral reference activities (human and animal health-related subjects and pathogens) and where possible with specific respiratory virus reference laboratories. A wider laboratory community might be addressed for sharing of protocols, SOPs, information sharing, etc. Interaction between working groups at the training sessions is fostered and interactive sessions between the different WP leaders, heads of labs are held during project meetings. Many workshops, training sessions and meetings have already been conducted and are listed under the "events" section of this website. The biosafety activities are implemented by both WP2 and WP3. The transversal activities range from sharing of documents, information and SOPs to sharing of training modules where appropriate.